Tomorrow, I'm off to Washington, D.C. for the annual Society for Neuroscience meeting. This conference is huge - 30,000+ attendees. My lab has a few posters, listed here. I hope to post highlights of interesting stuff I see, maybe even some photos. I went to SfN two years ago, and one of the greatest parts is the vendor exhibit. They reserve one hangar-size room for biotech, imaging, publishing, etc companies to set up booths and hawk products. These booths are just like those you might find at other conferences (like the Consumer Electronic Show, for example), but instead of big HD TV displays and video games, they have hi-tech microscopes, pipetters, and analysis software. Anyone can browse the goods, and there is a ton of free stuff. I'm hoping for a plush rat and a squishy brain stress ball. There are also scores of free publications, and, as usual, candy, to go around. There's science to be seen, sure, but conferences are really just big parties. Academic meetings are infamous for illicit hookups and other decadence among Ph.Ds. I probably won't post on what I see of those (at least not pictures). I like D.C., and I expect the city to have a certain energy given the recentness of the election. The G20 summit is also going on, so if I see Angela Merkel, I'll be sure to give her a shoulder rub. Update: I know, bad blogger. A dearth of updates the past couple weeks. The conference was fun, but uneventful science-wise. I saw a bunch of posters, met some people, and explored Washington. The past couple weeks have been super busy. I had a presentation, a paper, and a lot of experimental work to do. At any rate, that is subsiding, and I am preparing to leave work for a brief holiday vacation. Hopefully that will mean more blogging. Continue reading "There will be brains"! The term civic scientist was coined by Neal Lane, former director of the National Science Foundation. I like it. Continue reading "Civic scientists"! Science's influence on society is immeasurable. Medicine, technology, engineering, telecommunications, and education, owe their modern existence to systematic observation and experimentation - the scientific method. Whether or not you care at all about it, science has had a direct and profound impact on your quality of life, health, communication, and entertainment. For these reasons, and zillions of others, science matters. Unfortunately, public perception of the importance of science has significantly diminished over the past decade, particularly in the United States. There are myriad reasons for this, but a large share of the burden may lie with scientists themselves. Sure, the Bush administration has done their best to discredit and make irrelevant science for eight years, and religious conservatives have waged the so called "war on science" for even longer. Those factors matter, a lot, but I think a large portion of the blame lies within the scientific community and people that call themselves science advocates. As a bunch, I think we've become complacent, satisfied to remain within our own tiny spheres of influence. We run experiments, publish papers, give talks, and maybe even blog, but at the same time, we allow the constant denigration of our craft - within government, among the media, and at the hands of anti-science groups. This passivity has become all too common; scientists are quick to spout their misgivings about the state of research in America, when provoked (for taped interview, say), but self-motivated outrage at their own cheapened status is seldom seen. That is not to say that the devaluation of science in America was caused by inaction among scientists. This is hardly the case, but I think this anti-science society persists in part because scientists as a group, and any science friendlies among the public, have not spoken up loudly and angrily enough. When the government rejects thousands of research studies from 50 years of investigation, and denies anthropogenic global warming, for example, the science-friendly public should have stood up, shouting and calling their congresspersons. We shouldn't have allowed this to pass, letting the big bad government rework reality as they pleased. We all share the blame for the current predicament, and so we all share responsibility to fix it. We need to return (were we ever there?) to the days when science was the first and last resort of public policy. When we need answers, we should look to the research, examine the data. Health care, energy, immigration, foreign policy, *the economy*, and many other hot-button political issues are directly informed and influenced by knowledge gleaned from scientific research. This isn't just about some "elitist," academic pursuit of knowledge (though there's nothing wrong with that! ), this is about coming to real-world solutions for current imperative issues. So we are now past the blame game, past pointing fingers, past all those hand-wringing cliches. There are real crises in the world that need fixing NOW, and science can help. There may not be much time to begin fostering trust and excitement in science among the public, and enacting science-based policy. Sarah Palin and Bobby Jindal, two unabashedly anti-science politicians, are among those that may challenge the future. We have in front of us an opportunity, the chance to take advantage of a science friendly administration to reinstate science as the driving force behind prudent government. Consider the multifaceted nature of your world. Consider the influences on your everyday life, where many disparate ideas coalesce into what you call society. For each of us, this world has its vital and precious parts. Let's keep it all intact. Continue reading "Science and Politics - Let's get it on"! After an busy week, in school and in politics, I return with some interesting figures of the breakdown of Tuesday's voting. The New York Times has an interactive electoral map that compares voting patterns this year with the previous four presidential elections. As you might expect, compared to 2004, the country swung heavily Democratic, even within states McCain won. 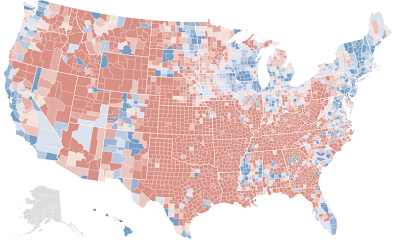 In this picture, blue areas represent counties that voted more Democratic than in 2004, whereas red areas are counties that went more Republican. You see a lot of blue, indicating a general increase in Democratic voting percentages across the country, except for parts of some southern states. Notably, you see a lot of blue in the Rocky Mountains, along the southern border, and among the northern plains states. One might draw the conclusion from this map that the country has renounced conservatism and embraced liberal Democrats once more, underscoring Obama's mandate to change the country. Well, for some perspective, consider this year's election in comparison to 1992, when Bill Clinton defeated George H.W. Bush. The 1996 map is similar. Our heavily Democratic 2008 voting bloc was considerably more Republican than it was sixteen years ago. What do we glean from comparing these maps? The country remains much more conservative even now than it was in the 1990's. The Democratic shift is relative, and reflects just how strong Christian conservative turn out was in '00 and '04. With practical issues like the economy on voters minds, they worried less about abortion, but the gap in social issues remains sharp (sadly evidenced by the passage of gay marriage bans in several states). Eight years of the Bush administration may have soured voters on George W. Bush, but it certainly didn't eliminate Republican support. What does this mean for Obama's presidency? Bipartisanship is key. Given that Democrats now control the executive and legislative branches, it will be interesting to see how they will get things done without alienating 46% of the country. 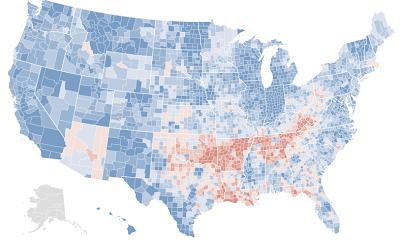 Continue reading "Visualizing the election results: now and then"!